We all know that keeping up with shoe trends can be an expensive feat (aural pun intended), and storing a shoe collection presents quite a challenge for those of us without Kardashian-sized closets. That's why consignment shops and online resale networks come in handy, right? But those come with their own sets of challenges, like long waits for payments, lack of convenience and general shipping hassles. 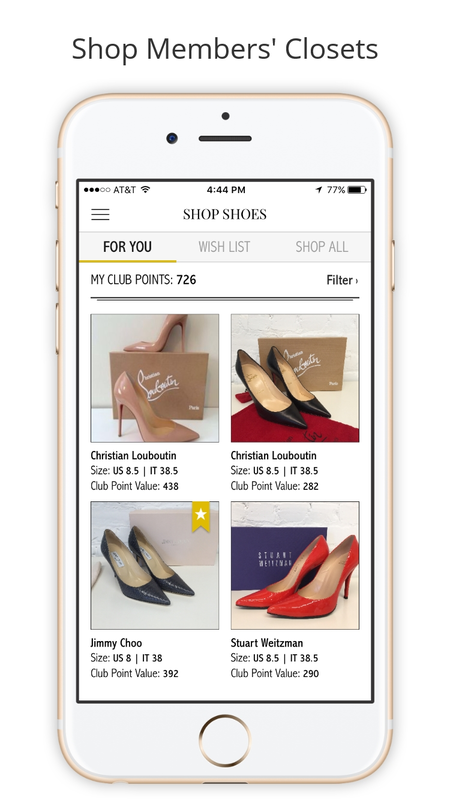 Luxury Shoe Club, (www.luxuryshoeclub.com) the recently launched trading club for pre-owned designer shoes aims to solve all of these problems via its membership model, ios app and next-generation shoe trading platform. After intensive research, Luxury Shoe Club's Chief Shoe Evangelist and co-founder, Scott Van Valkenburgh, said he realized that the key to simplifying the shoe reselling process was to create a way for women who wear the same size to trade shoes. Luxur Shoe Club actually works on a points system instead of actual cash, with each point equaling $1. When a user lists a pair of shoes, LSC's proprietary algorithm determines its fair market resale value and instantly pays up to 50% of that value to the listing member. The remaining amount is paid once the shoes are bought. The club offers members personalized shopping, express shipping, free shipping boxes, at-home pickup and a 7-day return policy. Yes. Well, it will soon. Right now (and for a limited time), in celebration of its launch, Luxury Shoe Club is waving its annual membership fee for members who list shoes within 7 days of joining. For those who miss that deadline there are three membership levels from which to choose: Intrigued ($49/ year), Passionate ($99/ year) and Obsessed ($149/ year). Membership level will dictate access to special services, including bonus Club Points, savings on purchases, discounts on shoe repair & polishing, free shipping boxes and free shipping for purchases. This sole club also has a heart. According to Luxury Shoe Club, it's a sustainable fashion company focused on driving social impact, and as such, it donates a percentage of its membership profits "to help women in need get back on their feet." Now, if you're feeling ready to join a mighty band of designer sole sisters, Scott has one warning for you, "be careful, the LSC app is incredibly addictive!"